It’s been a while since I’ve done a building series post! I figure I better get back to it before I forget about the whole process now that we have lived here almost two years. Today, I thought I would share a little more about where to make budget cuts. I mentioned a few ideas in this post here a year ago, but I thought I would delve a little deeper in this Building Series – Where to Splurge vs. Save. Here’s a look back at the house that used to be here and some evidence of the trees that had to come down. 1. Showers. We put in regular old fiberglass showers with shower curtains. I’ve talked before about my hatred of glass shower doors and hard water (which we have even with a softener – it’s a nightmare), and it’s still true. Our water is so bad that it has started to erode the drain in my daughter’s shower. I can’t imagine if we had done tile, how the grout would hold up. 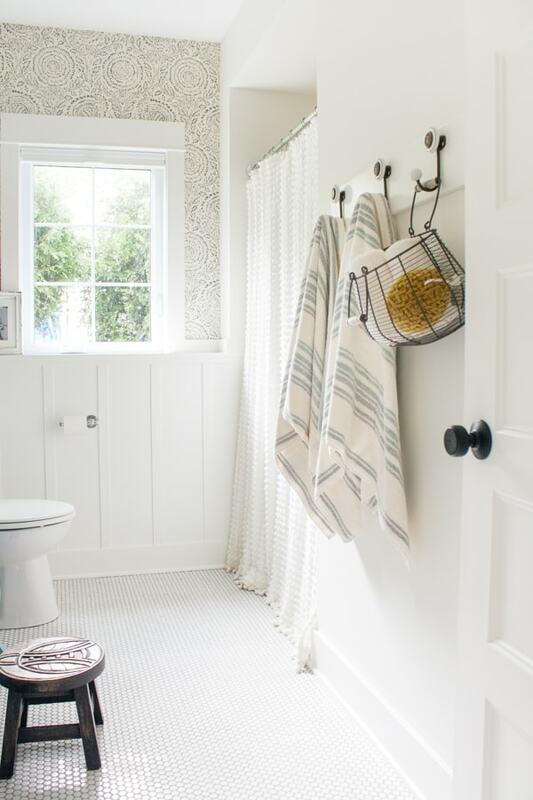 That said, I still would love to have a prettier shower space one day (however impractical that may be), but it was the same cost as the ceiling treatment in our family room and I would pick that any day over a fancy shower. 2. Inexpensive carpeting. I had picked out some beautiful patterned carpet for the inset carpet in the basement family room (similar to our stair runner), but it was a $$$ so I swapped it out for something less expensive. Judging on the number of times my kids have spilled on it that was a good call. We can always swap it down the road when they are a bit older (or out of the house!). I was able to splurge on my carpet runner because I saved on the basement carpet. 3. Less can lights. Our electrician was great at helping out on this he would say “ok in the basement for it to be super bright you would want 6-8 can lights, but you can probably get away with 4 lights if you don’t need it really lit up.” With the 4 can lights down here we actually use them on a dimmer the majority of the time because if we are down here at night it’s typically to watch a movie. I would rather use lamps and have softer overhead lighting at night, so we went on the lower end with can lights everywhere except the kitchen. Don’t skimp where you really need task light, you want to be able to see what you are doing in the kitchen! Another example is in our master bedroom he recommended we use the main light fixture, the wall sconces, and a few cans if we wanted extra lighting. We skipped the cans and rarely ever turn anything on but the sconces (well and you all know I’m hunting for a new light fixture since our fan is broken too). There are also only 4 cans in our upstairs family room along with our big chandelier that gives off plenty of light. This seems like a small thing but it all really adds up! 4. Closets. I did good ole wire shelving in all of our closets (which I shared on Instagram stories this week). Originally we were going to have a nice wood closet system with built-in drawers, etc., but I decided to spend that money on custom shelving in our pantry. Someday I hope to swap out the wire shelving in our master closet for wood, or even an IKEA system would be great in there too. 5. Cabinets vs Drawers. All of our cabinets in this house were custom built and they did an amazing job on them! I worked really closely with our cabinet maker to design everything and he was great at helping me cut out a few things. For instance, drawers cost a lot more than cabinets doors to build. Even less expensive than that was having cubbies for baskets. 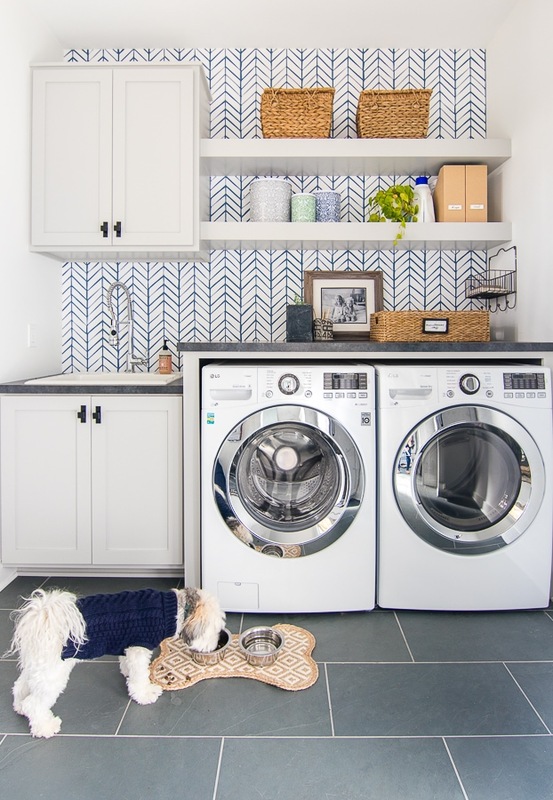 We cut out about $1,000 in the mudroom by eliminating drawers on the bottom of our built-in locker system and adding baskets instead. I love the way it looks and it’s been practical storage for us too. That allowed me to shift that money toward the kitchen cabinet budget which was more important to me. 6. Inset cabinet vs traditional cabinet. 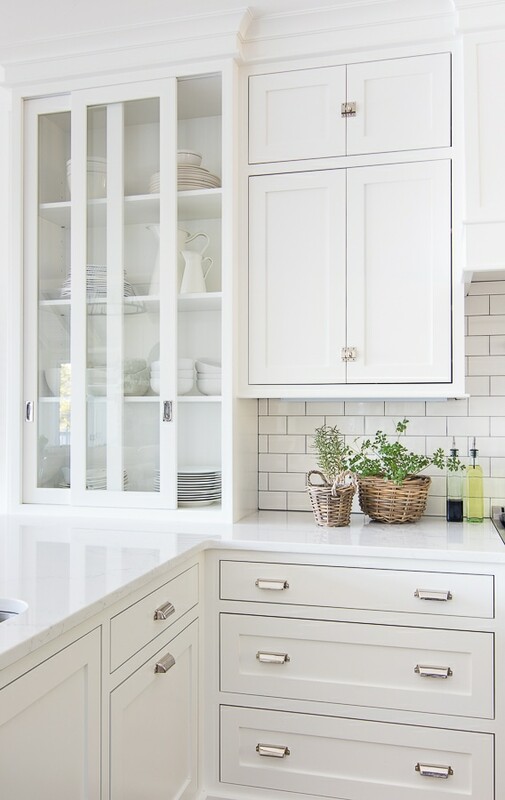 I really wanted inset cabinets this time around because I love the classic look of them. So we did them in the kitchen, master bath, mudroom and living room. Down in the basement, we switched to regular cabinets on the wet bar and in my kid’s bathroom to cut the cost a bit. 7. Built-ins, in general. Originally my daughter was going to have a window seat and shelves built in her room and we scrapped that when we went over budget on light fixtures. We could always add it down the road, built-ins are an easy addition. It turned out to be a happy accident because she loves her hanging swing chair instead. 8. Countertops you can swap out. If I could have, I would have put quartz everywhere. Alas, it didn’t fit the budget. Laminate counters are very economical compared to much more expensive quartz, and by putting laminate in our kid’s bath’s, laundry room and wet bar, we saved a ton. I’m hoping to swap out the wet bar countertops sometime this year if I can find a good remnant. 9. Add backsplash later. Originally I had wanted a tile wall in our pantry and I’m glad I skipped it because I love the wallpaper in here instead. 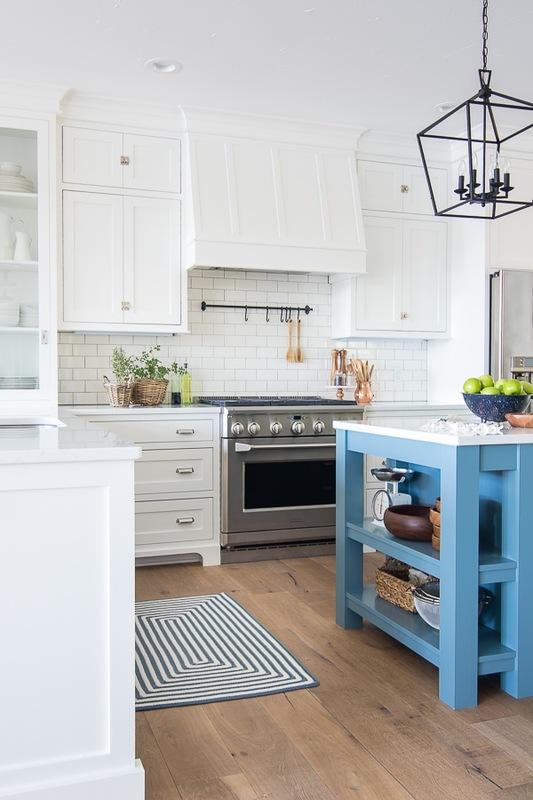 You could apply this to your kitchen too and skip the backsplash for now. Again tile is another easy addition down the road. 10. Landscaping in phases. Once you finally make it through the building process you need to grade, add grass, and plants! We had our landscape architect draw up our plans in phases. We have phase 1 done which was just general plants and grass. We plan on adding phase 2 (a firepit down by the lake) and phase 3 (changing the landscaping by the pool across the street, the fenced area, and adding an outdoor kitchen) someday down the road. Someday we plan to add an outdoor kitchen area to this space by the pool. (If you are new here, it’s across the street from our house – you can see the front door in the background). 11. Hardscape. We just have plain old concrete everywhere like our patio in the backyard and our front porch. Eventually, I would love to put Blue Stone over the top of everything probably when we do phase 2 or 3 of landscaping someday. 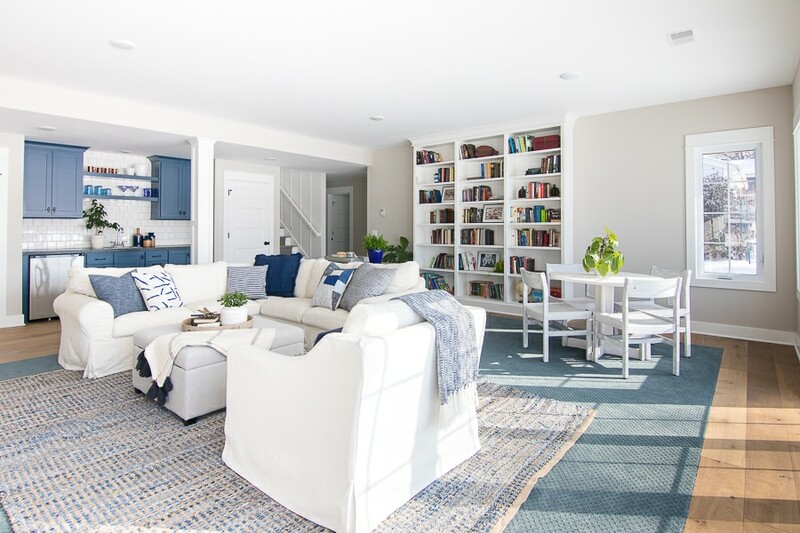 But for now, it’s totally useable space that a pretty area rug dresses up. Probably my biggest advice, especially if you are building your forever home, is to think in phases. I love to have a project (clearly! ), so the thought of not having everything all done perfectly at once can be fun. For us, it gives us space to dream and really live in the space to see how we are going to use each area in our home/yard. No matter what your budget, I think the idea of figuring out your priorities and where to splurge vs. save is useful to everyone who may be building or planning to build in the future. It’s really tempting to throw the budget out the window (for me at least) and get everything you want now. I’m really thankful that the Mr. and his spreadsheets reigned us in (for now at least – maniacal laugh, maniacal laugh!). Very useful information, Kelly! I wish we hadn’t put four can lights in our master bedroom vaulted ceiling. I’ve dusted them more than I’ve ever used them, and I don’t dust them often. ;) Thank you for sharing your gorgeous home. I love your decorating style! You have personal touches everywhere yet your home is uncluttered and so beautiful. Thanks Dori, I don’t like to dust either ha! Your house is gorgeous. I too am finishing our house in phases – we are on the pool phase right now – YAY!! (Ok, I skipped the landscaping phase to go right to the pool lol) but I am encouraged to think of getting landscaping drawn up in phases, so then we have a plan to continue down the road. Great post! I LOVE every inch of your home – so absolutely gorgeous. The building tips are very helpful as well. Thanks so much Kelly it was such a fun process to design and build! Your home is beautiful. I love how the windows sit out from the siding. A new touch from the traditional bay window. I also like how you used different styles of siding. The whole thing comes together so nicely. Thanks for sharing the pictures and information. I bought an older home (yikes) and had big ideas so your information is very helpful! I am building a home to be near my kids. You have given me so many wonderful ideas. Being stressed and then finding you has been a life saver for this grandma. Look forward to you each week. THANKS!!! We did the flip side of that… we offered to build our daughter a house if she’d bring our adorable grandson “home” to Texas! She did, and we did! Great ideas and information! Do you happen to have a drawing of your plans? I love the size and layout of every room! Thanks for posting this info. Love your blog. Hi Sara, unfortunately due to an agreement with my architect I’m not able to share our plans online – thanks! Such useful info for anyone about to start that process!! Good post! We are in the process of building our lake home. After tearing down as well! Already over budget after hitting rock! It will be a summer weekend home so really need to watch the budget. Thanks for your ideas. Did you use colored siding or is that painted? Hey Sandi, the tear down and hauling away can be so expensive! 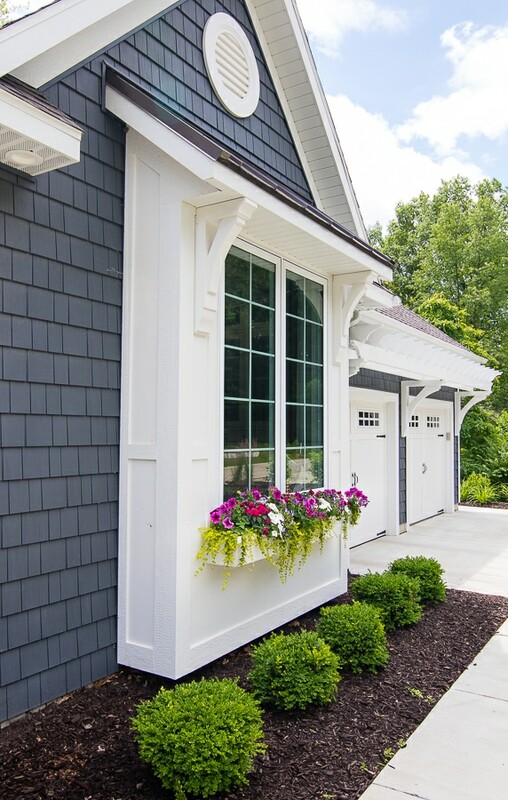 Our vinyl siding is by Mastic the color is Natural Slate – thanks! 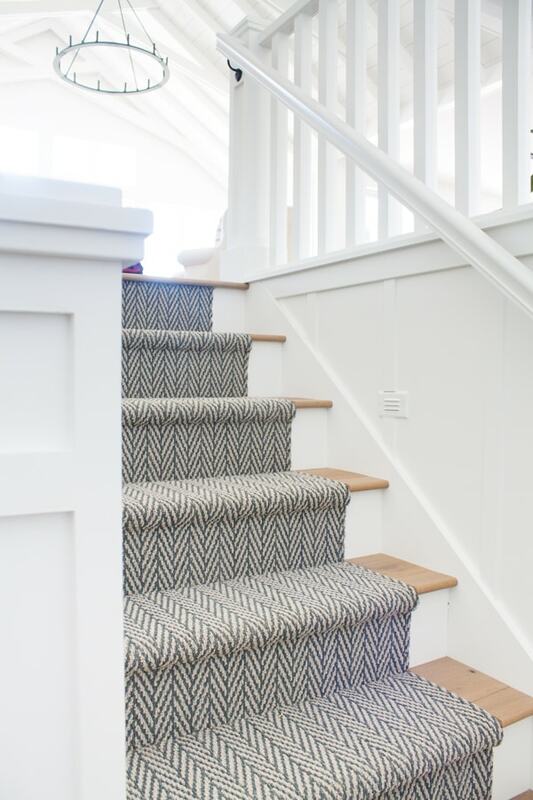 I love your stair runner, Kelly! Have you posted info on it before? We are in need of one on our only staircase that gets high traffic. Did you have a carpet company install it, or did you have your contractor do it? I’m not sure where to start. Our stairs are wider than standard, so it’s possible I’ll have to do something custom. I just love the look of yours! Thanks! hi Amy it’s carpet from Shaw and it’s inset into our wood floors. I’m sure if you found a shaw dealer near you they could help you out! Love your beautiful home! 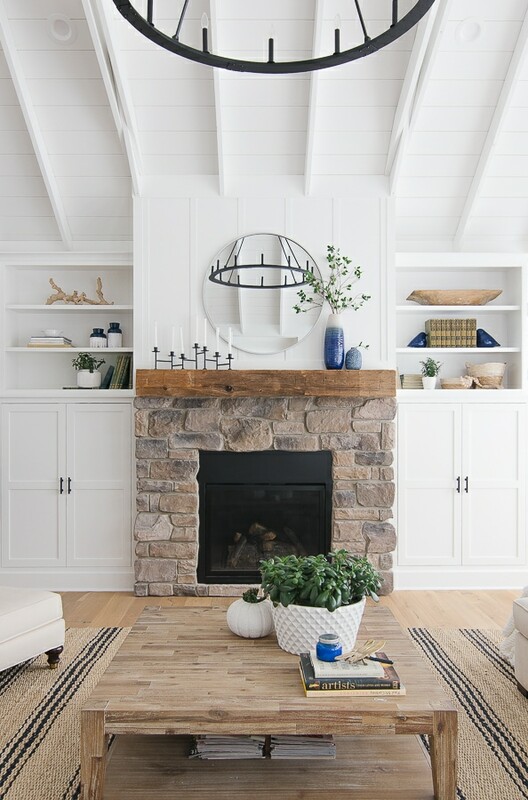 Did you purposefully decide not to use horizontal shiplap instead of the vertical planking you chose so that it would be more timeless vs trendy? 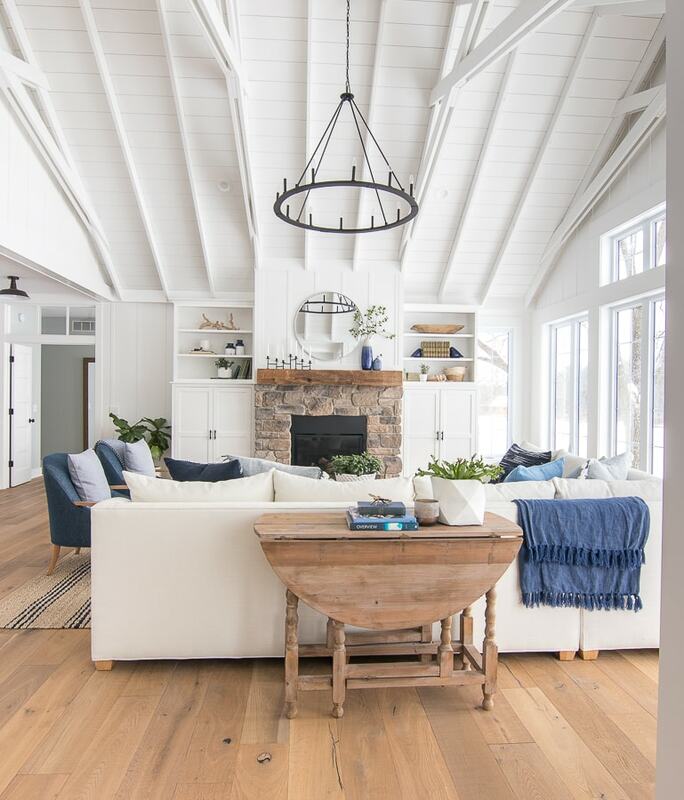 Hey Susan, I feel like the board and batten we did is more of a classic cottage/lake house look vs shiplap tends to be more of a farmhouse feel. My grandparent’s original cottage on this lake has vertical paneling throughout the entire cottage and it was built 65 years ago so I just love the timeless feel. Check out Closet Design, LLC in Holland, 616-772-1119. They did our closets and were very reasonable! We built back in 2014 and as I was reading your posts I keep nodding my head – I saved in the same places you did! Although our home is much smaller than yours :) We also did laminate in the bathrooms, cheaper carpet option, basic bathroom vanities and skipped some built ins. These things we can change over time. I wanted my quartz in the kitchen for sure! I also put some basic light fixtures in the kids rooms until I could find fixture I really wanted when I decorated their rooms. Yes isn’t it crazy how a price jump like that goofs with the rest of your budget?! A little bit here and there all of a sudden adds up to $20k quick! It will be worth it! Also – Kelly…Your hair looks amazing for having hard water… what’s your secret? I don’t see any brass! Lol. Purple shampoo is my BFF and I do get a Malibu twice a year. I’m growing mine to my natural color just so I can avoid dealing with the blonde highlighted brass! I use Pravana purple shampoo, do Malibu treatments once a month or so and have my stylist put a toner on all the time too. It is such a pain!! I’ve gone darker than I used to be to try to avoid some of the orange as well. We are currently rebuilding our lake house. This post was very helpful. I wish I had seen it before the electrical was done. I definitely could have left off some can lights. Is there a place on your site to see your paint colors? Thank you for this helpful post! We are in the middle of building a new home, and we’ve quickly hit the “where should we spend vs save” phase, so it’s awesome to read your advice. 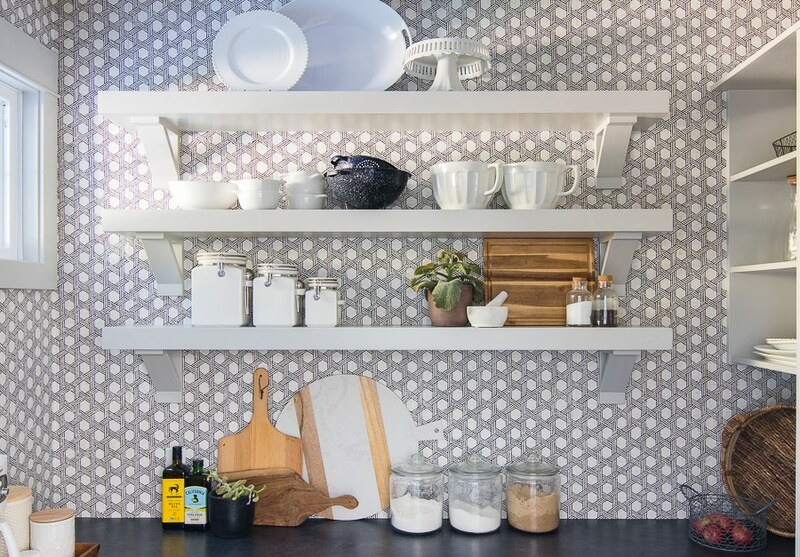 One quick question, what material did you use for the countertop in your pantry? 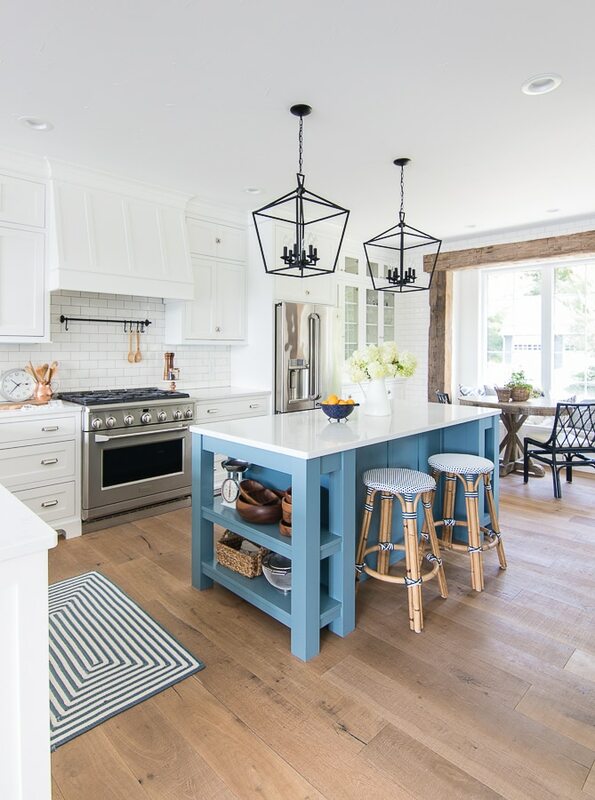 Hey Christie, it was originally supposed to be butcher block but we had a hard time sourcing something that was the right color for the floors. So it’s laminate for now but I hope to change it out down the road as well. Thanks! Thanks, Kelly! We’re doing quartz in our kitchen, but our pantry is similar to yours and will have working countertops, house appliances, etc., but I’m hesitant to spend much more money on countertops in there since it’s all behind the scenes for now. Would rather save for more visible places! I love EVERYTHING about this house! Beautiful job!! Hi Kelly I’m building a lake home in Michigan right now and your posts are very helpful. Can I ask which cabinet manufacturer you went with in the kitchen? Hey Ann, all of our cabinetry was custom built which we loved. It was nice to have someone bring the ideas in my head to life! Hey Donna! Yes I should have mentioned that about weighing what will be costly to swap out later like windows, walls, exterior choices. Sounds like you have it all figured out, so fun that you are getting to add the things you want now! Loved this article. 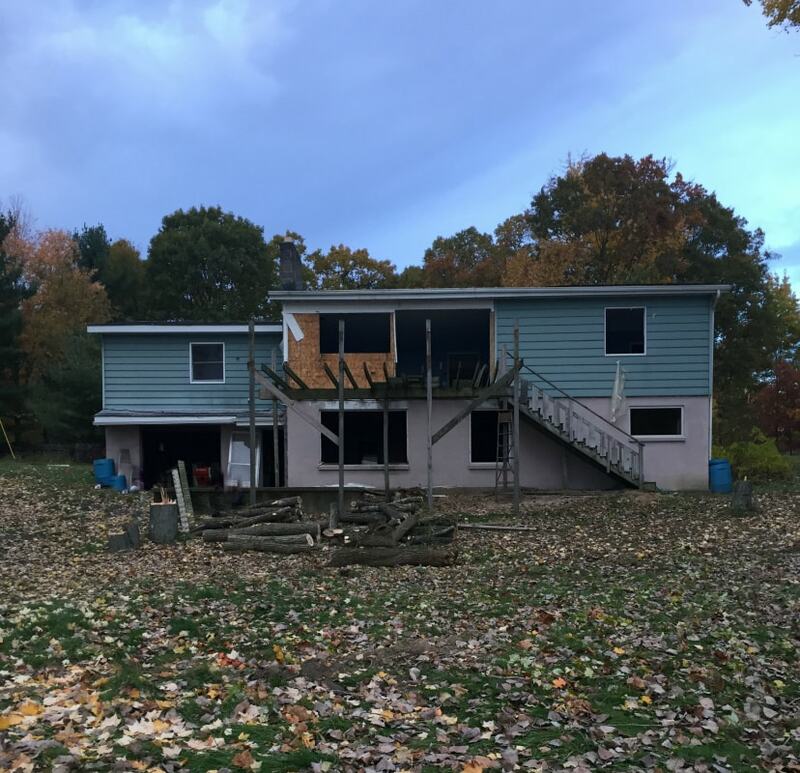 We are at the very, very early planning stages of a massive renovation/addition. I absolutely loved your advice about the showers. I was worried about upgrading our daughter’s bathroom to a tile shower as it will eventually transition into a guest bathroom in the next few years. But with the sand and saltwater I was not 100% on board with tile and grout. Not to mention gaggles of teenage girls coming in off the beach. Even with rinsing off in the outside shower I find the sand still finds away into the house. Just curious about what lead you to your builder? Word of mouth, reputation, developer of where you built? I want our builder to be a good fit. We are meeting with a 4th builder in a few weeks. I am optimistic about this one since he really seemed to get our vision during our first phone call. Thank you! Hey Erin, I think I have a blog post that talks about how we got started choosing a builder if you search building series on my blog I talk a bit about it. We interviewed several. Glad this post was helpful for you! Love what you’ve done with the house! Can you comment on how the wood flooring from Build Direct is holding up? Would you purchase it again? Hey Andrea, if you go to my instagram and watched my saved stories there is one labeled wood floors where I talk a bit more in depth about them. I do still love them and would use them again but they are a bit more high maintenance than other options. Thanks!